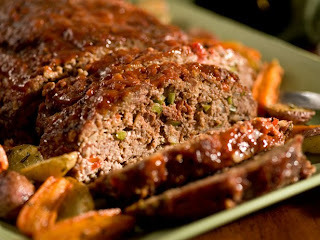 This meatloaf recipe from Paula Deen is our favorite. I think that using oats instead of breadcrumbs makes it less "loaf"-like and more tender and meaty. Mix all meatloaf ingredients well and place in a baking dish. Shape into a loaf. Mix ingredients for topping and spread on loaf. Bake for 1 hour, covered with foil. 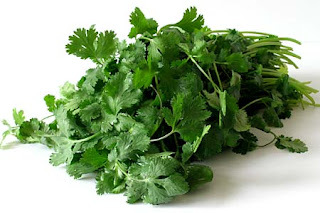 I found this great blog post on how to preserve cilantro. I don't know about you, but I love cilantro, despite the fact that I can't seem to use the stuff before it goes bad in my fridge. Can't wait to try it out so that I can have yummy herbaciousness all the time! 1. Scramble eggs and break them up into pea-sized pieces. Set aside. 2. Cook onion in butter and oil until tender. 3. 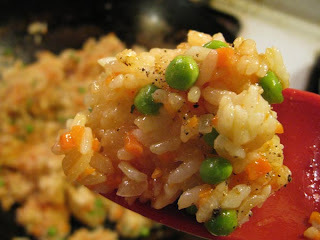 Add carrot, rice, and soy sauce. Cook until warmed through. Season with salt and pepper to taste. 4. Stir in frozen peas, eggs, and sesame seeds just before serving. Arrange the vegetables in a single layer on a tray or work surface. Lightly spray both sides with olive oil cooking spray. Preheat a grill or grill pan over a medium-high heat. Grill the vegetables in batches until both sides are nicely charred and the vegetables are just tender, about 10 minutes for the pepper, about 8 minutes for the eggplant and onion, and about 6 minutes for the zucchini. When the vegetables are cool enough to handle, cut into 1/2-inch pieces and transfer to a large bowl. In a small bowl, whisk together the olive oil, vinegar and oregano. Pour over the vegetables and toss. Season, to taste, with salt and pepper. Gently stir in the tomatoes and mint. 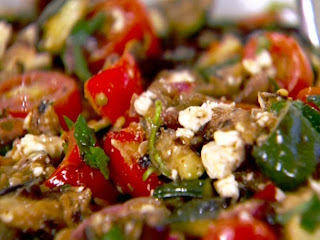 Divide the salad between 4 plates and sprinkle with the feta. Preheat oven to 250 degrees F. Line a baking sheet with parchment paper and set aside. Place egg whites and cream of tartar in a clean, dry bowl of a stand mixer and beat until foamy. 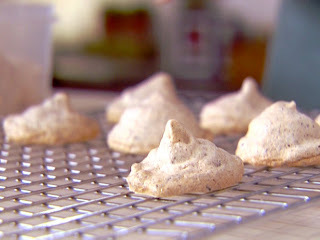 Add sugar and almond extract beat until meringues hold soft peaks, about 3 minutes. Fold in chocolate gently until just incorporated. Using a pastry bag or a sealable plastic bag with the corner snipped off, pipe meringue by the tablespoon onto cookie sheets. Bake for 40 minutes, then remove from oven and let cool completely before removing from parchment paper. Transfer to an airtight container. *You can make your own superfine sugar by placing sugar in a food processor and processing on high for 30 to 45 seconds. 2. Boil penne until tender but still firm (2 minutes less than directions on package) & drain. 3. Combine cottage cheese, ricotta, & 1/2 c. of mozzarella & parsley/basil and marinara sauce in a large bowl. Add penne and toss to coat. 4. Place pasta mixture in a greased 9x13 baking dish. Top with remaining mozzarella and parmesan. Bake for 30 minutes. 2. Cut puff pastry into a 9" circle (I don't think this is neccesary, you could just have a square instead). Bake for 10 minutes until golden brown. Let it cool completely on a wire rack. 3. Cook the sugar, butter, lemon juice & cinnamon in a sauce pan for 5 minutes over medium heat until slightly thickened. Toss in the bananas to coat. 4. 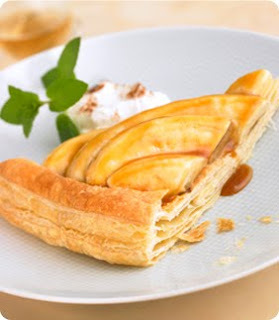 Spoon the bananas onto the pastry. Serve with whipped cream.